:- This pirk has been around for over six decades, copied by many, given different names, but never improved upon ! Its body is slightly S-shaped through the flatter profile which gives it an unpredictable fluttering action both on the way down and on the way up. 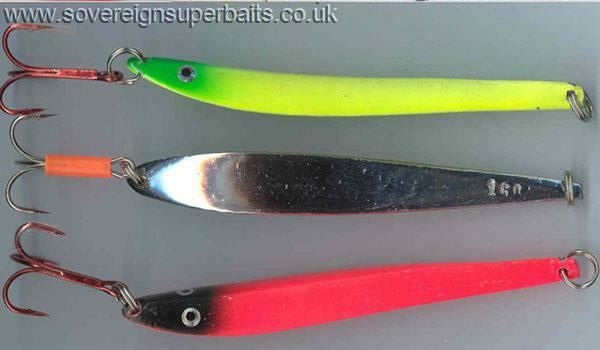 These are designed for shallower reefs under 100 foot & are also great for casting and work well in a heavy tide. We have done some serious damage just off the Forts on the Isle of Wight & the main land, (known locally as Victoria & Albert) where the reef is a little over 60 feet deep. 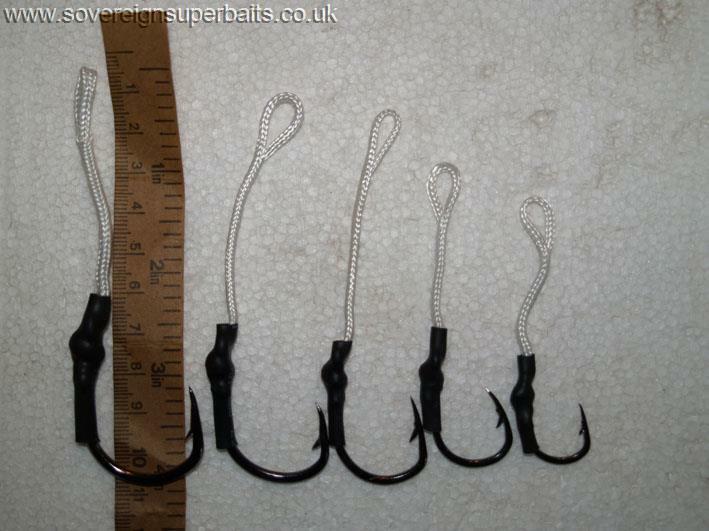 These also come with Worth heavy duty, stainless steel split rings, VMC O'Shaunessy pattern 8626-BL 6/O hooks and your choice of 6" Fat muppet on the larger ones & a suitably sized hook & muppet on the lighter ones. Once again these can be pimped with the aide of our range of foil & stick-on eyes. Assist Hooks: We have had these "assists" made from top quality Japanese 4 X semi circle hooks & 250lb test parachute cord, with the knots shrink wrapped to protect the knot from sharp teeth. They are available in 2/0, 4/0, 6/0, 8/0. & 10/0. The 10/0 are 10cm OA, the 8/0 & 6/0 are 9cm OA & the 4/0 & 2/0 are 8cm OA. The hooks themselves are used by commercial tuna fishermen in Japan & they trust these hooks with tens of thousands of pounds worth of tuna, in fact they trust them with their very livelihood, so they should be good enough for us recreational anglers !! These assist hooks are made in the UK with the best possible components assembled from around the world. : This is probably the best and least technical pirk ever made. It has a 1.5mm marine grade (316) stainless steel skin filled with lead so no matter how long you leave it lying around in the shed between fishing trips, it can always be buffed up in a few seconds to a mirror finish with nylon a scouring pad. Our "SS Skin" pirks are also fitted with VMC O'Shaunessy pattern 8626-BL 6/O hooks, blue-tinned for extra strength, light reflection and salt resistance. They are held in place by Worth heavy duty, stainless steel split rings and come furnished with a 6" Fat muppet in the colour of your choice. This all saves precious hours fiddling with split ring pliers the night before you go fishing not to mention the inevitable treble in the finger! All in all this is the Rolls Royce of pirks at sensible money. : These are the original fast sink pirk. They will hit the bottom in around half the time of a banana pirk. These pirks are quite simply cast lead with a few microns of chrome in the case of the silver ones or acrylic paint in the case of the painted ones. These are intended as an inexpensive option to the holographic knife-edge fast sink pirks that you can pay anything up to £30 each for. These also come with Worth heavy duty, stainless steel split rings, VMC O'Shaunessy pattern 8626-BL 6/O hooks and your choice of Fat muppet colour. If you feel like "Pimping" them up, then take a look at our range of foil & stick on Eyes. Banana Pirks:Our banana pirks are either chrome plated or powder coated, made in Poland specifically for us. 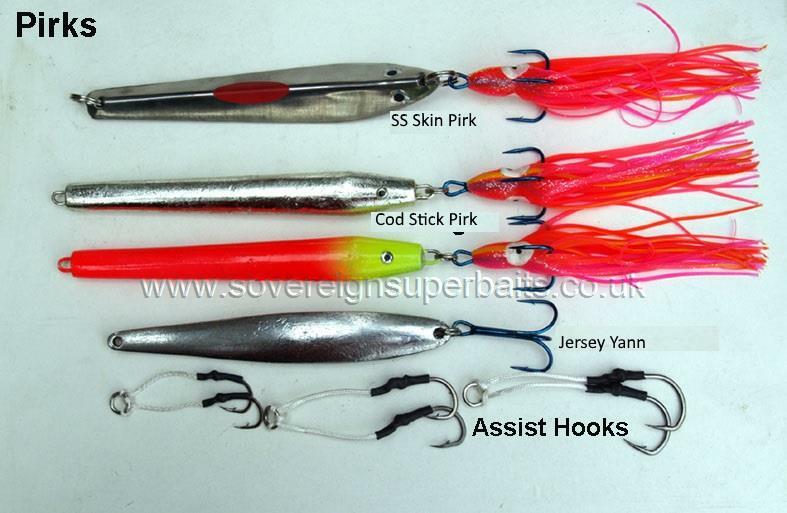 They come equipped with Berkley split rings and VMC trebles and are available in seven weights and three colours. Banana Pirks are running very low and due to the international lead price have gone up massively. Therefore we will not be replenishing stocks. To avoid dissappointment phone or email prior to ordering to check availability as it changes by the day. Please remember when we package pirks they have to be made safe to handle by postman / courier. This adds anything from 3/4 kilo to 2 kilos to the weight depending on the volume of pirks. 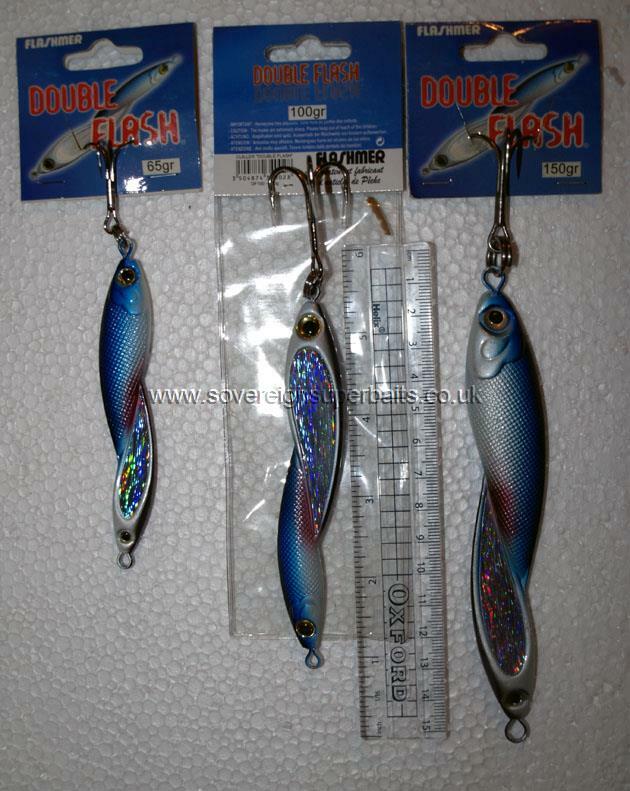 Flashmer Double Flash: These are a fantastic "Double fish" jigs/light pirk. They are painted on one side & have holo foil on the other, alternated on both fish so both sides have both finishes. They come in the three most popular weights, 150gms for working over wrecks, 100gms for casting & wrecking and 65gms for casting & jigging around structure & rocks. With a string of three feathers above, you have a serious "fish catching rig" for wrecking. On the smaller ones we have had some great Bass Plaice & even Wrasse from the rocks. These are a great all rounder, which because of their revolutionary shape have been very underrated & we have them at a great price, around 30% cheaper then the competition.